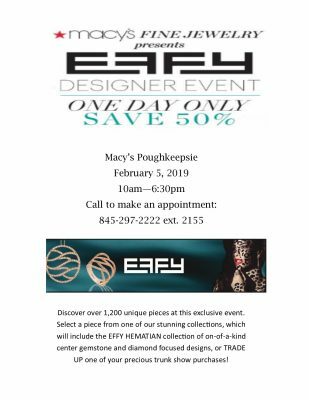 Macy’s Fine Jewelry Trunk Show – February 5! Discover over 1,200 unique pieces at this exclusive event. Select a piece from one of our stunning collections, which will include the EFFY HEMATIAN collection of on-of-a-kind center gemstone and diamond focused designs, or TRADE UP one of your precious trunk show purchases!